One of GWP's most successful programmes was the Great Little Trains of Wales and this new DVD / BluRay brings many of the lines featured in the original right up to date. There is coverage of the now completed Welsh Highland Railway plus all new footage from the Ffestiniog, Vale of Rheidol, Welshpool & Llanfair, Bala Lake and Llanberis Lake Railways. 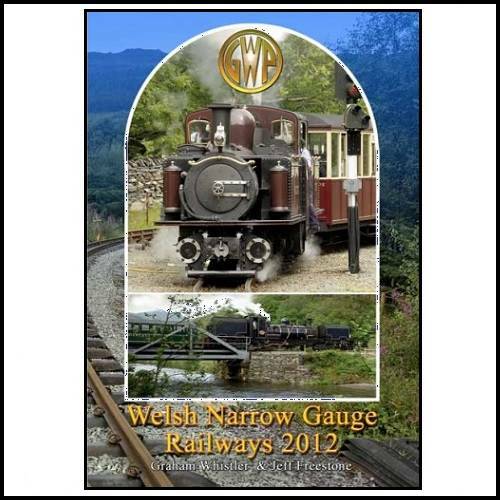 About "Welsh Narrow Gauge Railways 2012"
The Welsh Narrow Gauge Railways run through dramatic countryside and operate with steam locomotives. The railways were mainly constructed for industrial use and most served the now defunct slate industry. Now they are all preserved and operate as major tourist attractions. WELSH HIGHLAND RAILWAY - Now fully restored and connected to the Ffestiniog Railway. Dramatic steam action with 2 Garratt locos. FFESTINIOG RAILWAY - An all new update on this well loved 2ft railway ending with dramatic run of two FR locos on WHR! VALE OF RHEIDOL RAILWAY - A dramatic 12 mile line to Devils Bridge from Aberystwyth. WELSHPOOL & LLANFAIR RAILWAY - Featuring busy summer services with two recently rebuilt locos. BALA LAKE RAILWAY - A friendly tourist railway with small locos and fine lake views. LLANBERIS LAKE RAILWAY - This railway in the shadow of mighty Snowdon, like Bala also runs the smaller quarry 2ft locos. Filmed and edited by GWP with the full co-operation of the railways. Running Time - approx 105 minutes.